So yeah. I'm finally actually making something that actually goes with the season. Believe it or not, this is not a bowl of soup. Aren't you proud? Stupid question. 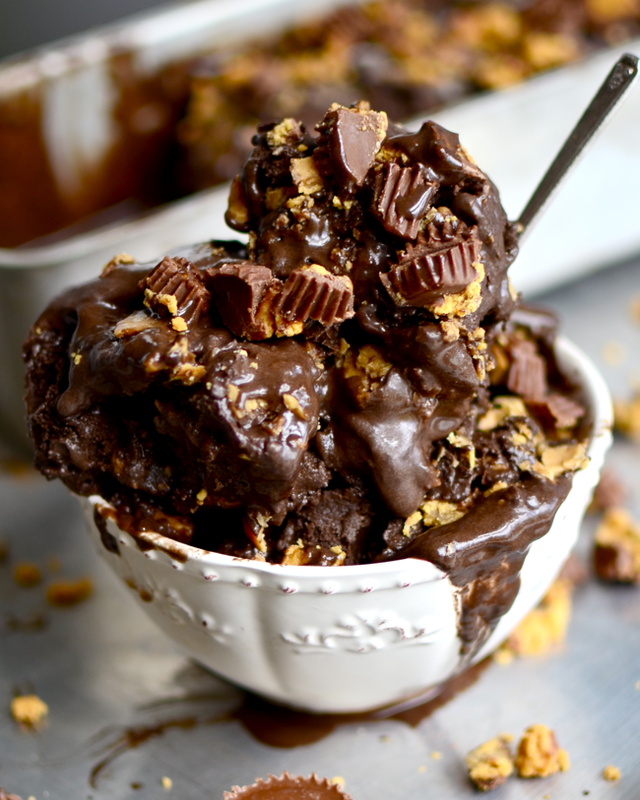 How could you not be proud of this dripping, chocolatey, peanut buttery pile of Reese's bliss? Seriously though, it is so hard for me to make things that actually go with seasons and holidays. I see all the other food blogs posting wings and dips at Superbowl time and sugar cookies and fudge at Christmas and I'm just like, "Hey, I'm eating a bowl of chili and hot chocolate in the middle of June. Yay." 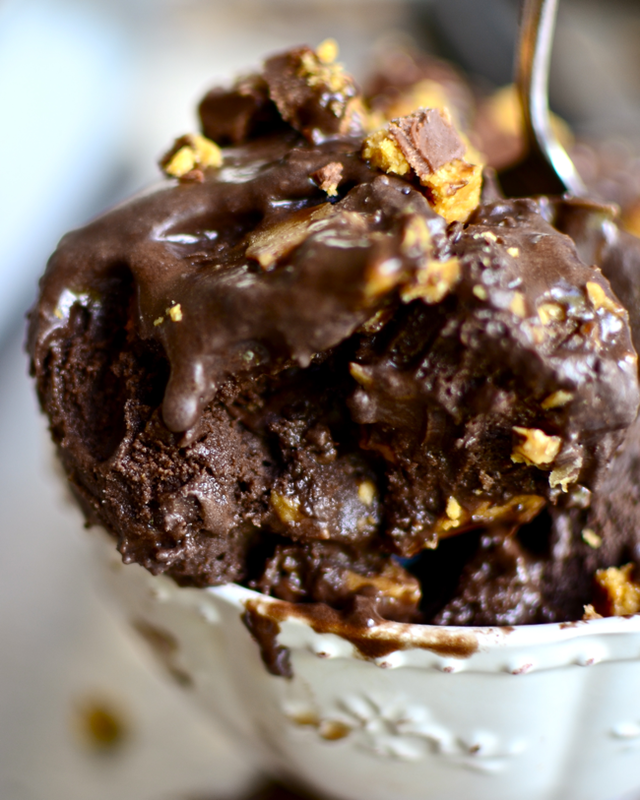 Not that I would never turn down a big bowl of rich and creamy homemade chocolate peanut butter ice cream on a swelteringly hot day if it was offered to me. It's just that... I'm lazy. I don't always feel like tempering eggs and stirring custard on the stove and waiting centuries for it to cool enough till I can put it in the ice cream maker . 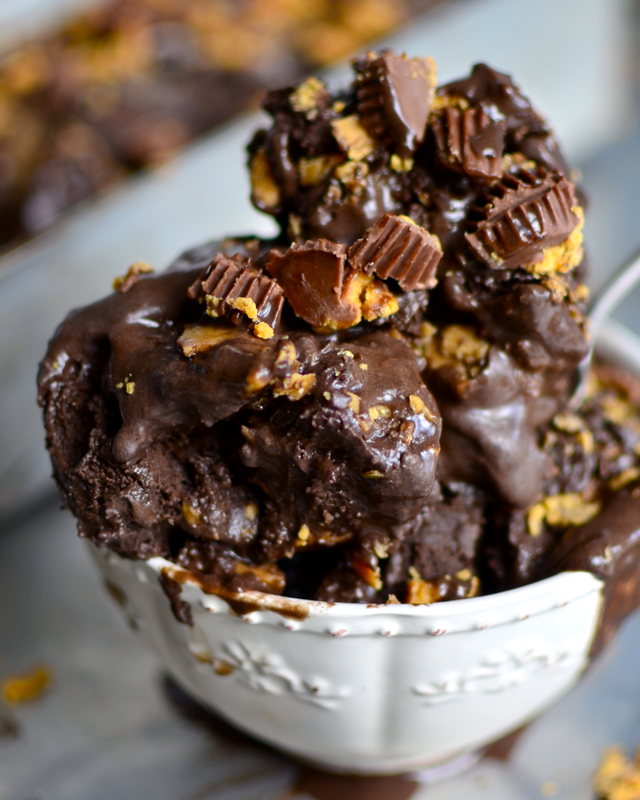 That's why I made this ice cream super easy.That way I can be lazy and eat tons of sugar and chocolate and peanut butter all at the same time. Problem solved. The end. 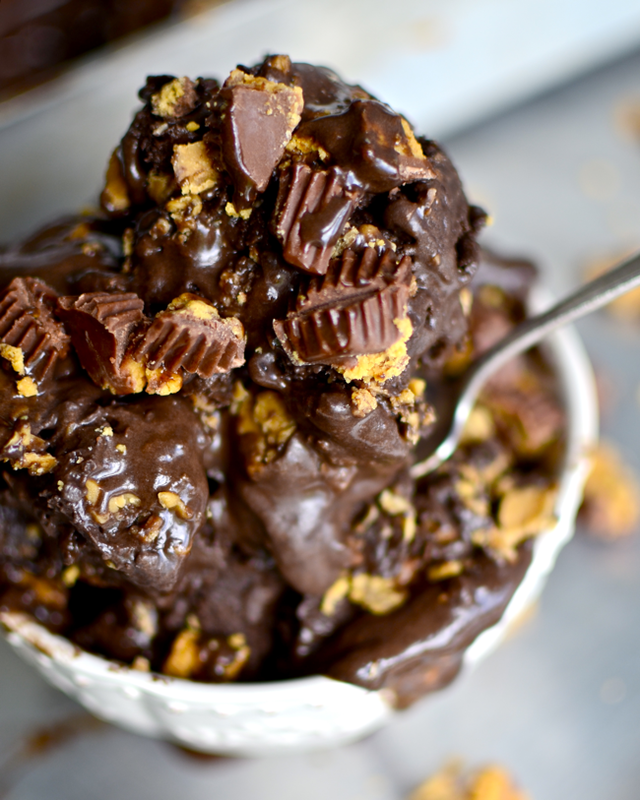 In a microwave safe dish, combine the cocoa powder, peanut butter, sugar, and 1/4 cup of the milk. Cook in the microwave, stirring occasionally until the peanut butter is melted. Slowly whisk in the remaining milk, a little at a time, until all of it is incorporated and mixture is smooth. Add the vanilla. If it's too warm, chill for a little while (it should be about 40ºF). 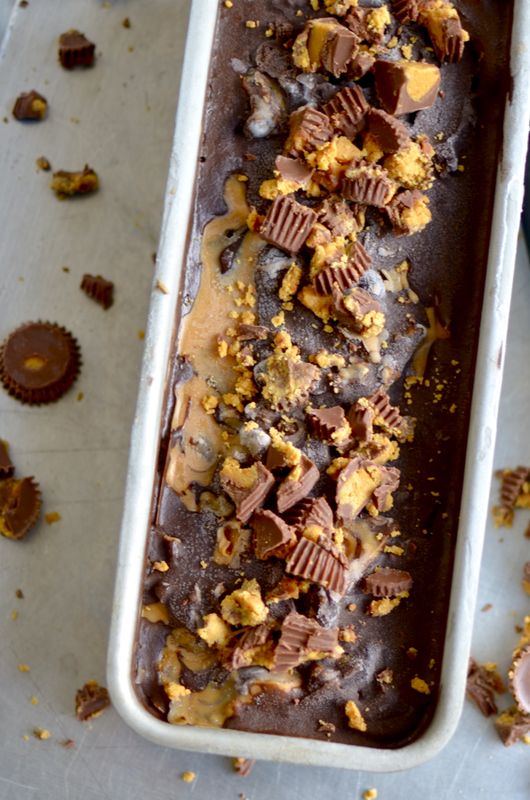 While the ice cream is churning, make your peanut butter swirl. Combine the peanut butter, coconut oil, brown sugar, and vanilla and microwave until melted and smooth. When the ice cream is done, place it in a container (a wider container is best) and pour some of the peanut butter swirl on top. You only want a very thin layer. It should freeze quickly, but if it doesn't, put it in the freezer for a few minutes. Then fold the ice cream to incorporate the swirl. Repeat this process until you've used all of the peanut butter swirl. Freeze for at least 3 hours for it to harden. 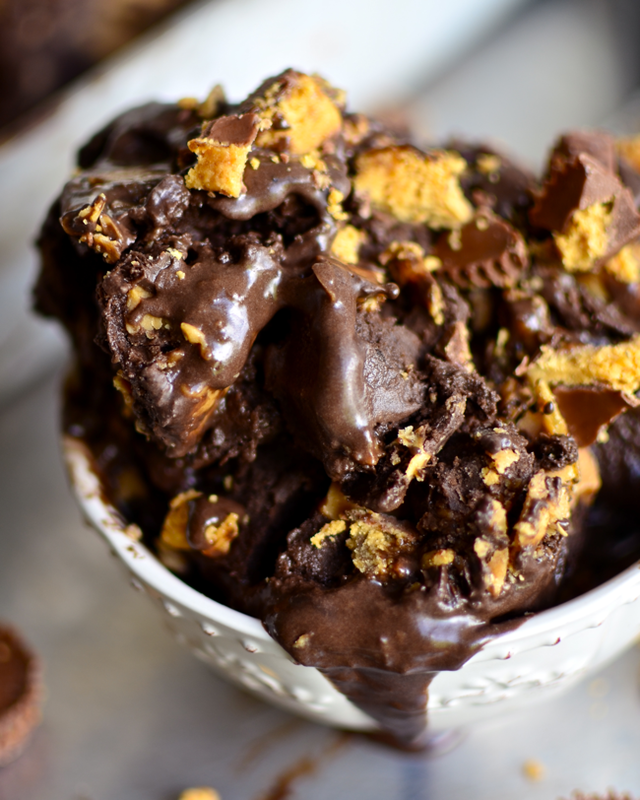 Serve with Reese's Cups (you can either sprinkle them on top or you can stir some in while you're stirring in the peanut butter swirl). *I have also used honey instead of brown sugar which worked great. Agave would probably be good too! Don't forget to follow Yammie's Noshery on Facebook, Twitter, Pinterest, and Instagram! Or you can receive posts in your inbox by enter your email address in the top right sidebar of the blog!